July 4th Fireworks at Sweet Repeats! WHITE and BLUE for July 4th! Accepting fall and winter only. Thank you! Afternoon is time to relax and the pool or swim in the lake. Hot and sunny is the forecast at Sweet Repeats. 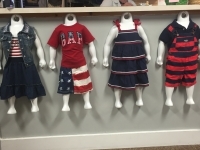 Stars, Stripes, Red, White and Blue…. have books, toys, DVDs, shoes, bags and so much more. in and pick up cool summer clothes for hot summer days.